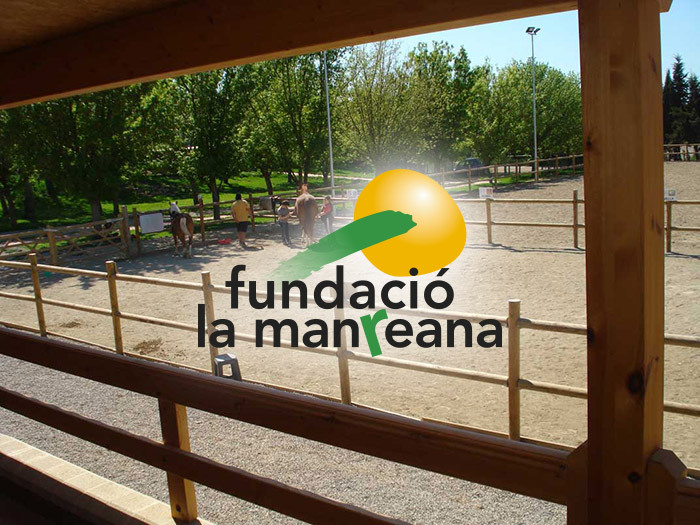 The Manreana Foundation was established in Juneda in the Garrigues area in 2009 thanks to an initiative of the farming school with the same name and a group of people that share the same social values. With an understanding of the needs of our society, they decided to join forces to set up, in a totally alturistic manner a social Project whose main recipients are disabled people and those at risk of social exclusion. Offer a space for development and global improvement for people with various disabilities (neuromotor, physical, psychic, sensory, etc. ), as well as a social adjustment skills acquisition work program directed at people at risk of exclusion. Both aspects will be carried out by professionals trained in the field of animal assisted therapy. Provide a complementary offer of leisure activities for the disabled, taking advantage of and adapting the facilities of the school farm so that all people feel comfortable during their stays. To seek economic collaboration between institutions, companies and individuals to provide a share of the cost of therapy to those users who need it most. Promote training, research and innovation in the field of animal-assisted activities, both therapeutic, psychoeducational or leisure. Group: educational activities linked to the curricular area, aimed at acquiring social adjustment skills and learning strategies (ESO curriculum adaptation groups, open classrooms, host classrooms, workshop classrooms). Individual: sessions aimed at the development of cognitive, social, motor and personal skills in children with educational needs or any need for timely accompaniment: learning difficulties, cognitive deficit, behavioural disorders, attention deficit with or without hyperactivity, emotional block, difficulty with communicative skills, among others. Group: activities with horses done promptly and directed to both children and adults (entities, institutions, groups, associations, among others). The Manreana foundation team structures activities assisted with different types of domestic or farm animals, depending on the characteristics and objectives to work. The external approach: animals help people in depressive processes, with low self-esteem, with mental illnesses, etc., to change the focus of their environment, getting them to shift their focus from their problems to the animals with which they interact. Increased relations, since the relationship with animals allows the opening of different communication channels. Feeling of acceptance. The animal does not judge us and accepts our presence as we are. Improvement of socialization among people, especially those who are institutionalized, reducing anxiety and stress, improving mood and decreasing feelings of isolation. Mental stimulation, as increasing communication helps the activation of personal memories. You have the possibility to carry out the workshops offered by the school farm, such as milk and its derivatives, bread making, vegetable garden, pork products … Always adapted to the needs of the group to whom we dedicate the activity. Consult the possibility of organizing stays of more than one night combining some of the areas of intervention. Sign language programs are designed with the collaboration of the Associació Deixa’ns Signar.